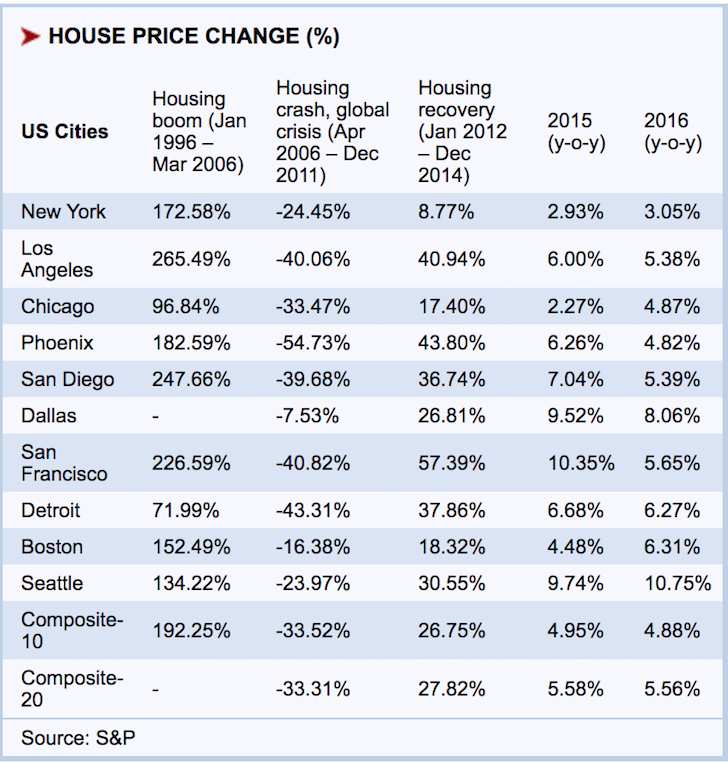 Could the Chicagoland Housing Market Impact Your Future Plans? Home is where the heart is. 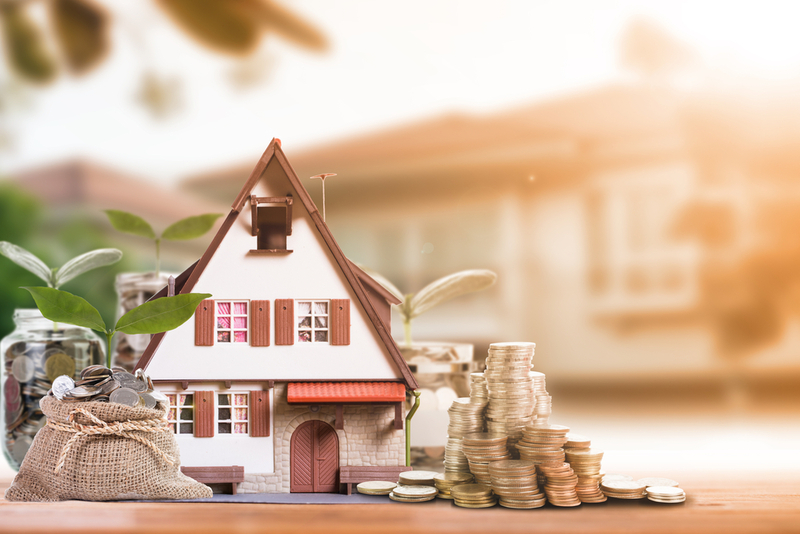 And, right now, if your heart is at home in Chicagoland, you may be wondering what will happen to its value, especially if you’re planning to buy or sell in 2019. What will the housing market do in Chicagoland in 2019? What are the forces driving prices up or down? What should you do if you’re about to buy or sell? Let’s see if we can get a better understanding of Chicagoland’s housing market. It’s the beginning of 2019 and Chicago’s residential real estate market is bracing for a bad year. Although the year has just begun, writing was on the wall late in 2018. For example, in November, Realtor.com’s survey of 100 Metro Cities reported that Chicago will have the weakest housing market in the U.S. in 2019 with declines in the number of home sales and in median home price. The estimate shows Chicago home sales numbers will fall 7.4 percent. The trends are different, however, for different parts of the country. For example, the numbers are more positive in Miami, Los Angeles and New York. The brightest outlook, according to the survey, is in Lakeland/Winter Haven, Florida, with predicted home sales growth of 5 percent and price growth of 7.4 percent. In Los Angeles-Long Beach-Anaheim, sales will grow 2.2 percent, while prices will increase 5.4 percent. Zillow’s late 2018 home price forecast put Chicago dead last. 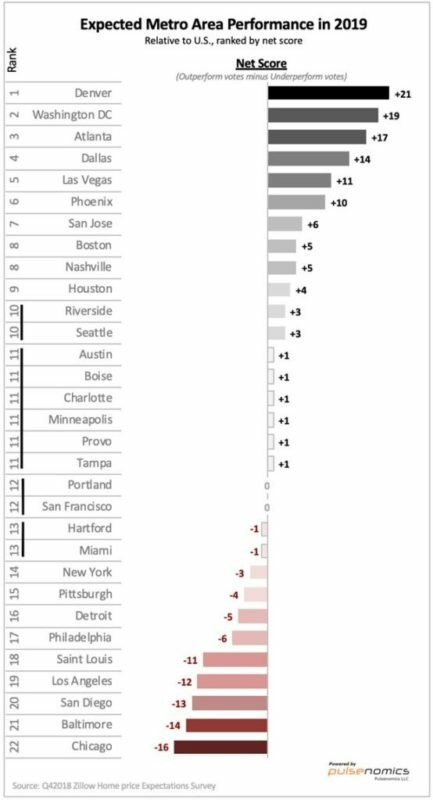 The list was developed by asking each of the survey respondents which three real estate markets they expected to outperform the rest of the country and which three they expected to underperform. Then they ranked the cities based on their total votes. This is a very long list and if you’re planning to sell a home in Chicago, think carefully. At the heart of the housing slowdown is Chicago’s slower population and employment growth compared to the rest of the country. Where there are less people and less jobs, there is less demand for housing. When there is less demand, prices fall, especially if there are higher levels of inventory, which is the case here in many areas of Chicagoland, especially in the higher priced part of the market. When we look back to the 2008 market and housing crises, Chicago had, like all housing markets, had a substantial loss (-33.47%). When the market recovered, however, Chicago was near the bottom of the list when compared to other major markets (+17.4%). Then, gains in 2015 and 2016 were modest and still trailing the market. Will that trend continue through 2019 and even 2020? Most professionals think it will. The puzzle gets more puzzling if we consider the impact of rising mortgage rates. With the surge in the 10-year bond yield all the way up to 3.2% in 2018, mortgage rates are following suit. They’ve come down a bit since the December stock market melt- down, but they are still at roughly 2.6%+ after being below 2% for years. A Jumbo ARM in 2016 was about 2.5%. This same mortgage was recently hanging around 3.5%. In other words, if you are a buyer today, as compared to 2016, and took out the same mortgage, your monthly payment goes from $3,951 to $4,535, a 14.8% increase. Now, compare that increase to the average rate of increase for income, which is around 2%, it’s clear that there is more pressure on buyers to find lower price values that are affordable to them, especially for the Millennial buyers who generally have little savings and lower down-payments. While a 3.5% ARM is still a pretty low rate, remember that everything is relative and decisions to buy or sell have many components over an above the rate of the mortgage such as job security, market conditions, general inflation, and specific housing market conditions in each locality. With all of these factors in mind, it’s important to remember that Chicagoland – both the city and the suburbs – is truly a market of neighborhoods. Market trends for one square city block could differ significantly from those just a mile away. There are certainly areas of Chicagoland that are projected to be more active than others in the year ahead. We all understand the basics of economics that when there is more inventory and the same or lower demand, prices come under pressure and fall. The construction boom we’ve experienced over the past several years is finally showing up in the data as a wave of new inventory hits the market. When there’s more inventory, pricing comes under pressure. Higher inventory also leads to flattening or lower rent prices. Most people would prefer to than rent. If rents flatten out, as is the trend, then, in the mind of the consumer, renting becomes more affordable than buying. And, if inventories are rising at the same time, the pressure on housing prices to fall is that much greater. Add to that the increases in property taxes, it’s logical to assume that rising properties will also pressure housing prices lower. Our taxes are due in April and it will be the first time we go through the income tax process under the new tax plan. For most renters, the results will be good: lower rates and a higher standard deduction should amount to lower tax bills. For homeowners, it’s a mixed bag. Some will benefit from lower rates and a higher standard deduction, but many others will find limited itemized deductions and personal exemptions mean a higher tax bill. Conceptually, we all know that limiting state income and property tax deductions to $10,000 and limiting mortgage interest deductions on new mortgages up to $750,000 are net negatives, especially for the more expensive real estate markets. Until these filings are complete, we really don’t know how much ‘pain’ the new tax laws will create and if they will impact the housing market. We saw a violent 20% sell down in the S&P 500 in December 2018. While 2019 has started on a very positive note, a downward move like we had needs to be taken seriously. Stocks are valued based on future earnings. A 20% sell down means the future is not looking as bright as it once was. Part of that future is the housing market. But, this market does not move as quickly as the stock market. For example, he housing boom that began in January 1996 ended in March 2006. But it wasn’t until the beginning of 2008 that people started to accept that the housing market had already peaked. Until 2008, property investors were still clinging to hope or at least were in denial that prices would no longer be going up. Once Bear Sterns was sold for nothing to JP Morgan in March 2008, people started to panic. Then Lehman Brothers went under on September 15, 2008, a full two and a half years after the housing market peaked. And things got even worse, with the S&P 500 finally bottoming out on March 9, 2009. Today, policy errors by the Fed, trade wars by Trump and slowing global growth, will cause companies to be more cautious with their spending in 2019 and beyond. Pay attention to what the stock market is telling you. But, when it comes to your real estate, whether you’re buying or selling, there is no rush as the real estate market takes 2-5 years to correct in relation to the peaks and troughs of the stock market. Home values rise and fall depending on a host of factors. Projections of the future may or may not come to pass. If you are going to make a change, to buy and/or sell, make sure that you do so in context with your larger financial plan. If you do, you will make better pricing, buying and selling decisions. Otherwise you’re just winging it and, if you are, the wind could take you to places you don’t want to go. Steve firmly believes that although money is important, the activities and relationships we enjoy in life are much more important. This philosophy is derived from his 30 years of working at solving the complex issues of retirement, in combination with his history of success in a wide variety of entrepreneurial, sports and artistic ventures. He holds an MA in Economics, is a Registered Financial Consultant (RFC) and a Certified Estate Planner (CEP).